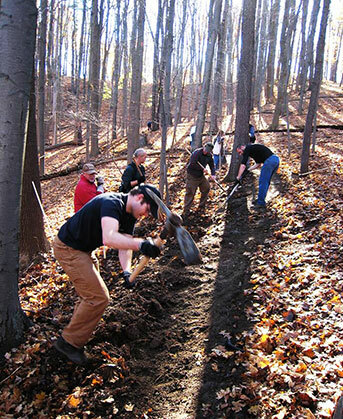 A volunteer trail-work party. Photo by Adam Reitz. My town of Rochester, New York, was not always a hot bed for trails. There was a time—as recent as the 1980s—when the runners of Rochester, like so many runners of other cities that lack quality trails, had no choice but to hit the roads. But, over the past 40 years, the county parks department and private trail organizations have worked together to change that. Master plans were created and trail lovers began to lay the groundwork for nearly 500 miles of well-maintained trail systems. Today, Rochester boasts 21 county parks, almost all with runnable trails. Numerous private systems are now open to the public, including the Crescent Trail, a footpath in nearby Perinton with over 46 miles of singletrack, and the Victor Hiking Trails, a system of 12 trails with singletrack, doubletrack and bike paths. With all of these new trails open and in use, I helped start an organization in 2012 called #TrailsRoc. It serves as a resource to bring the 21 county parks and multitude of private systems together in one place. #TrailsRoc leads runners on weekly runs on different trails, helping them learn the systems and gain confidence to explore on their own. In addition to the trail runs, #TrailsRoc hosts trail-work days and keeps an eye out for undeveloped areas in which new, sustainable trails might be built. How can you make the same thing happen for the town where you live? Read on. 1. Have a plan. Objectives, ideas and trail-map designs will move you in the right direction. 2. Get buy-in from local officials. 4. Develop partnerships with local outdoors groups. 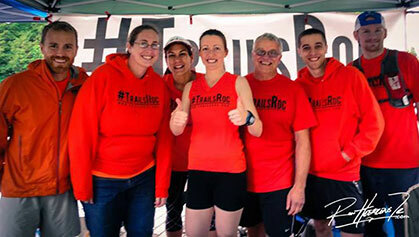 A few members of the #TrailsRoc crew. Photo by Ron Heerkens, Jr.
Not everyone in your town might think a trail is a great idea, so advocating for the benefits of the trail is vital to the process. Getting the local community on board is the best way to move forward, as your local government is likely to support what they do. If you can form as an organization like the CTA did, your probability of success goes up. Unckless also suggests taking time to form officially for other reasons. 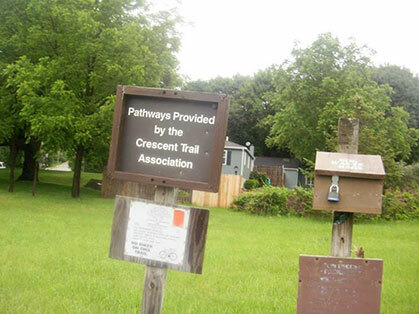 The Crescent Trail Association is a 501(c)3 non profit, which helps with funding and grant writing and adds legitimacy to what they do. People are more likely to work with, donate to, get involved with and see you as a benefit to the community they live and work in if you are an official organization. Creating a trail is more than just cutting down a few trees and clearing the brush, says Adam Reitz, who works with the Genesee Off Road Cyclist (GROC), a mountain-biking organization that has built many trail systems in Rochester. The International Mountain Bike Association has published materials that outline standards for sustainable trail design. These standards have been adopted by countless land managers and agencies when developing guidelines for best practices, and can be a great place to start if you’d like to learn more about trail design and building: http://www.imba.com/resources/trail-building. Keep in mind that, on some lands such as established wilderness areas, power tools are not allowed. Some public lands may also have restrictions on structures such as bridges and walkways. Reitz says part of the planning process for your new trail should be working with local authorities to determine allowable materials and tools and other requirements. “Requirements for bridge and boardwalk design are often specified by land managers,” he says. “Their specifications conform to usability/accessibility and insurance.” For example, a town or county may establish a regulation that boardwalks need to be at least two feet wide—and, if more than 18 inches off the ground, require a handrail for safety reasons. Be sure to educate yourself on any and all local guidelines before you begin building. Both the CTA and the Victor Hiking Trails are built and maintained almost all by volunteers. The CTA has recruited a group of 12 volunteers who meet every Wednesday from April through November to work on trails. Working on reports from those who use the trail, these groups tend to specific needs each week. The CTA equipment includes walk-behind trail mowers, string trimmers, chainsaws and hand tools, all purchased by the CTA using dues and donations. Local towns can help by adding resources when they can. Your volunteers do not need any trail experience to help build a trail but they should be paired with experienced trail builders and be willing to learn something new while working hard. Volunteers should plan to bring whatever tools are needed for that days work plan. That can include shovels, rakes, clippers, and, if permitted, power tools. In the end, building a trail is about community. You don’t need to reinvent the wheel here; the trails you see did not build themselves. A quick Google search will put you in contact with trail lovers with a wealth of knowledge and experience to help you get started building your own trails. Racers enjoying their trails. 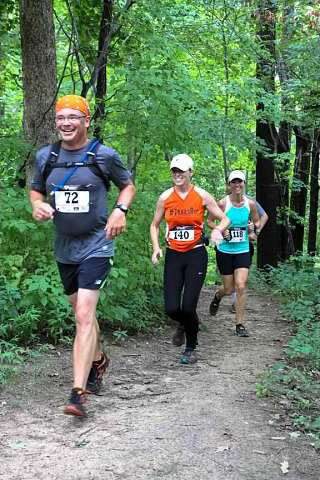 Photo courtesy of #TrailsRoc. Your trail is built! It is a beautiful space to enjoy the outdoors, so what happens when someone comes along and wants to run a race on your new system? There will be hard work, especially during the start-up days, but the rewards will come when you are finally the one posting pictures of sun-spackled singletrack in your neighborhood—and knowing you made it all happen.